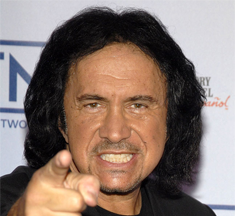 “Last November Afterdawn.com reported that Gene Simmons, founding member of the rock group KISS, had gone off on Nine Inch Nails, Radiohead and college aged pirates, going as far as to call Radiohead “idiots” and saying “Every little college kid … should have been sued off the face of the earth,” for their unauthorized downloading of course. He has followed his last tirade with some new comments, this time again blaming NIN and Radiohead but more importantly, the music fans. “The record industry is dead,” Simmons notes “It’s six feet underground and unfortunately the fans have done this. They’ve decided to download and file share.” He then insisted that the aforementioned bands were “contributing to the demise of the record industry” by using new intelligent sales models that apparently he does not approve of. Of course, he neglects to note that at every turn the “dead” music industry continues to push consumers away, using the RIAA watch dog to sue children, grandmothers, and even deceased members of society while failing to confront the real problems the industry faces. Music fans have been sharing music since there was music to share. Some marketing analysts might even consider this behavior a form of free advertising. Historically, the RIAA has sued or lobbied against any form of recordable device or media. Why…, g.W_ep, of course. Their stance is that if you buy a record or CD, but want to hear the music you just purchased on a cassette player, than you need to buy the tape as well. Enough is enough. Downloading songs from the internet has and should change how music is distributed. Imagine this, what if musicians/artists/bands relied on live performance for the majority of their income. As if their talent and ability were the driving force behind their success instead of knowing someone or buying your way into a deal. Don’t get me wrong, awe-inspiring talent exists, but explain Milli Vanilli to me.